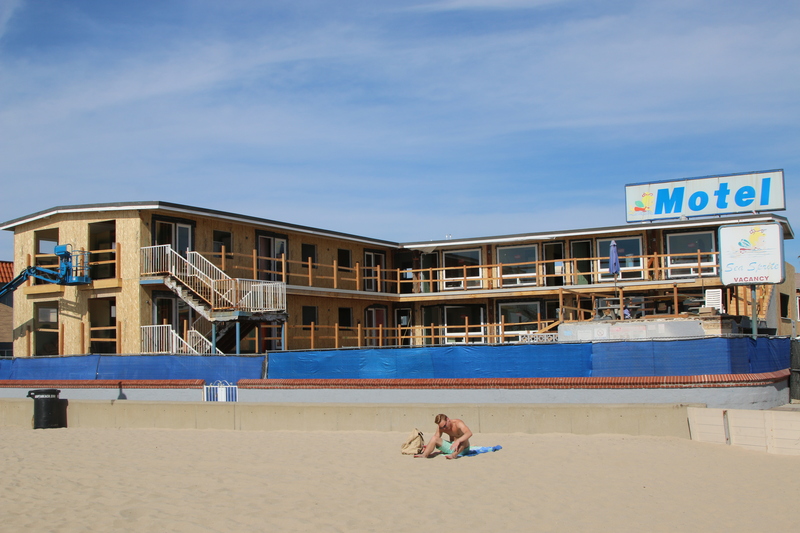 Hermosa Beach’s Sea Sprite Motel, which has provided affordable lodging right on the beach for decades, is undergoing a remodel, the first visible changes since it came under new management last year. The renovations are mostly cosmetic and do not increase the hotel’s occupancy or number of rooms. The most visible change to passersby on The Strand will be the removal of the pool, which will be replaced with a patio accessible to the disabled. Other changes include upgrades to the plumbing and heating systems, and replacing fixtures in some of the bathrooms. The changes are already prompting concern that the Sea Sprite will be the latest corner of Hermosa to become out-of-reach for all but the ultra wealthy. “Wonder what the new prices are going to look like?” wrote one commentator on Old Hermosa, an Instagram account documenting the city’s changing character, in response to a photo of the construction. “Iconic, now heartbreaking,” another responded, complete with a cracked-heart emoji. The hotel remains open, although its website indicates that the construction means that there is limited availability. Over the weekend, it was encircled in fencing and a blue cherry picker was parked at the hotel’s north edge for work on the upper rooms. The stucco exterior has been removed, leaving the wood frame exposed. But plans indicate the building will be restuccoed. Last fall, longtime owner and operator Darrell Greenwood said the family still owns the property, but that Vista Investments, an El Segundo-based hotel company, was managing it on behalf of a third party, whom Greenwald declined to disclose. The Los Angeles County Assessor’s Office lists no sales of the Sea Sprite property since the hotel came into existence in 1966, when the land was purchased for an assessor estimate of about $75,000. But plans for the renovation on file with Hermosa’s building department list the owner as Wilshire Capital Partners. Wilshire’s website describes it as a “private real estate firm that invests in apartment, office, retail and development opportunities in major markets in the Western United States.” The Sea Sprite is the first property listed in the web site’s “Portfolio” section, and includes several renderings, including future rooms decorated with pastel color schemes and grainy surf photos. The plans, which received the last of multiple city approval stamps on Jan. 16, list a Beverly Hills address for Wilshire. But according to the company’s website, it is now headquartered in an office on Rosecrans in Manhattan Beach. Wilshire did not return calls for this story, and an email sent to an address listed on the website bounced back as undeliverable. Megan Thompson, an employee of Vista Investments listed on the plans as the architect, also did not return calls and emails. Especially for travelling families, the Sea Sprite promised affordable lodging, which the California Coastal Commission has warned is rapidly disappearing along California’s beaches. The “cottage” unit, next to the motel, could sleep as many as 10 people, leading to low per-head rates. Some of the rooms had stoves, so that visitors could cook instead of relying on restaurants. According to the plans submitted to the city, the stoves will be removed, and the gas lines in the rooms will be capped.